It is a honour to speak at this joyous gathering, marking the Seventy-Ninth Anniversary of Pakistan Day. I extend warm greetings and sincere good wishes to Ambassador Waseem Akram and his team at the Embassy. 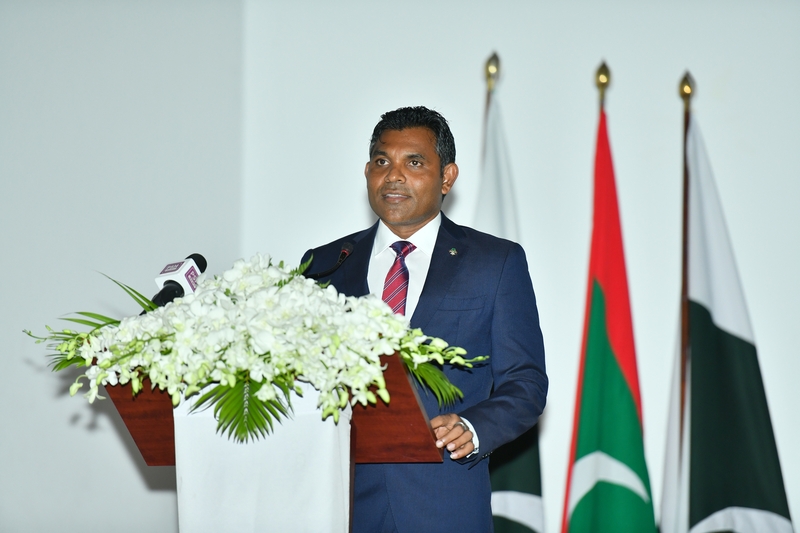 Also, on behalf of President Ibrahim Mohamed Solih, the Government and the people of the Maldives, I take this opportunity to convey warmest regards to President Arif Alvi, Prime Minister Imran Khan, and to the brotherly people of Pakistan. The Maldives and Pakistan have had formal diplomatic ties for over fifty years. Our long-tenured friendship stems from our common culture, shared faith in Islam and our mutual respect and understanding. The Maldives appreciates that Pakistan has played a prominent role in the socio-economic development of the Maldives. We cherish Pakistan’s continued assistance to us in a variety of fields. As our two countries continue to work collaboratively in further strengthening regional cooperation in South Asia, I am sure that in the years to come, we can together, ensure the prosperity, safety and stability of South Asia and the Indian Ocean region. Rest assured that The Maldives remains ready to assist Pakistan on all beneficial spheres of engagement bilaterally, regionally and on the wider international arena. Indeed, we are committed to further enhancing our longstanding culture of cooperation for the sake of ensuring a better quality of life, for the citizens of both our countries. I conclude by once again conveying warm felicitations to the Government and the people of Pakistan on this auspicious day. May peace, progress and prosperity prevail for the people of Pakistan. Thank you very much and have a wonderful evening.